Windows 8 provides an unprecedented opportunity for developers to create applications for a new and exciting platform, for an entirely new market. Leveraging modern C++ and the new Windows Runtime, this book guides you through the many facets of WinRT whilst using modern C++ features for ultimate power and performance. 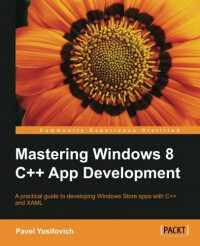 "Mastering Windows 8 C++ App Development" shows you how to create Windows Store apps that use many of the new features and functionality available for Windows 8. You'll discover how you can harness the power of the new Windows Runtime with C++ combined with XAML for the creation of fantastic user experiences. Starting with coverage of C++/CX (a set of extensions that make working with WinRT easier) and user interface design with XAML, this book shows you how to use major Windows 8 features, including Live Tiles and Contracts, while leveraging common patterns such as data binding and the Model View ViewModel (MVVM). You'll discover how WinRT works, its various capabilities, and how it can best be leveraged using C++11 and Visual Studio 2012. Specifically designed to be an engaging and practical tutorial, Mastering Windows 8 C++ App Development will augment your skills and help you create high quality Windows Store apps. If you are a C++ developer who wants to utilize the combined power of COM, WinRT, C++/CX, and XAML to build Store apps for the new Windows 8 platform, then this book is for you. Prior experience with XAML-based technologies is not required. Network synchronization deals with the distribution of time and frequency across a network of clocks often spread over a wide geographical area. The goal is to align (i.e. synchronize) the time and frequency scales of all clocks, by using the communication capacity of their interconnecting links. The aim of this little book is essentially to make you familiar with the hardware environment of the computer. Most people have heard of software programs, whether they are involved directly with computers or not. Many people know roughly how they work and what they are used for. The hardware of the PC, however, is less well understood.